Democratic presidential candidate Hillary Clinton, center, greets supporters as she visits her campaign field office in Oakland, Calif., May 6, 2016. U.S. Democratic presidential candidate Hillary Clinton inched closer to the party nomination with a caucus win Saturday in Guam. Clinton won 60 percent of the vote, earning four of the seven delegates on the tiny Pacific island nation. Her rival, Vermont Senator Bernie Sanders won three delegates. However, Sanders picked up nearly 50 delegates in Washington state. He easily won the state caucus on March 26, beating Clinton by nearly 50 percentage points – 73 percent to 27 percent. He received 25 of the 34 delegates awarded that day. However, an additional 67 district-level delegates could not be apportioned until the state could produce vote data broken down by congressional district. Democratic presidential candidate Sen. Bernie Sanders speaks to a gathering of supporters during a campaign rally at the Lexington Convention Center, in Lexington, Ky., May 4, 2016. Similar to other states, Washington state has a multi-step process for awarding delegates. Election officials had to wait until county conventions were completed May 1 before they could generate more detailed information. District-level data show Sanders will receive 49 delegates, and Clinton will receive 18, The Associated Press reported. Despite the Washington results, Clinton maintains a lead in the overall delegate count with 2,228 delegates. She has more than 93 percent of the 2,383 delegates needed to win the nomination. Sanders has 1,454. Former secretary of state Clinton is on track to clinch the nomination by early June. 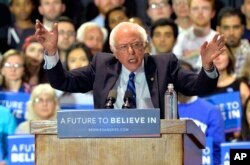 Sanders has said he has no plans to quit before the final primary votes have been cast in June. Yet Clinton is already looking ahead to a matchup in November with billionaire businessman Donald Trump, the sole Republican presidential candidate. The Democratic convention will be held in Philadelphia July 25-28. The Republican convention will be held a week earlier in Cleveland, from July 18-21. Meanwhile, Trump repeatedly spoke of "Crooked Hillary" - his nickname for the Democratic front-runner - during rallies this weekend in Oregon and Washington state. From left, U.S. Senator Elizabeth Warren, a Democrat from Massachusetts, at the California Democrats State Convention in Anaheim, Calif., May 16, 2015, and Republican front-runner Donald Trump at a rally in Eugene, Ore., May 6, 2016. He also continued a tirade against Senator Elizabeth Warren, a leader in the progressive movement. On Wednesday, soon after Ted Cruz and John Kasich dropped out of the race for president leaving Trump as the sole candidate on the Republican side, Warren took to Twitter to chastise Trump in a flurry of nine tweets in which she accused him of being racist, sexist and xenophobic. Warren, revered among progressive Democrats for her work in creating the Consumer Financial Protection Bureau, went on to accuse Trump of inciting violence among his supporters and supporting Russia’s strong-man President Vladimir Putin. Trump was referencing Warren’s controversial claim that she is part Native American, which first became an issue in 2012 when Warren was running for the Senate in the state of Massachusetts. During that campaign, it was reported that Warren claimed Native American heritage while applying to teach at both the Harvard Law School and the Pennsylvania Law School. Warren has long defended her Native American ancestry as based on stories told to her as a child by her parents, but has produced no official documentation to make the connection.